Let’s say we have a Splunk dashboard with multiple panels. Each panel has its own search request and all of these requests work independently and simultaneously. If they are complex enough, rendering the dashboard may take quite a long time and some panels may even fall by timeout. How to avoid this? The first step is to understand how the searches are related. May be it is possible to select some base searches, and reuse their results in other child-searches. It’s also possible to get cached results from the “Saved Searches” (another name of Reports in Splunk GUI). The child-search with a base parameter will wait until the related base search is completed and then will execute own request using base search results as an input. Note that the request in the child-search should NOT begin with “|”. Base searches can help to eliminate unnecessary requests, but they don’t solve the main issue: what if the base search request itself takes a lot of time to execute. It is especially sad to run it each time on rendering the dashboard, if the actual data does not change often: once a day or an hour. For example in a case of software installation data, which I mention as in “How to create and manage Splunk dashboards via API” and “Asset Inventory for Internal Network: problems with Active Scanning and advantages of Splunk“. 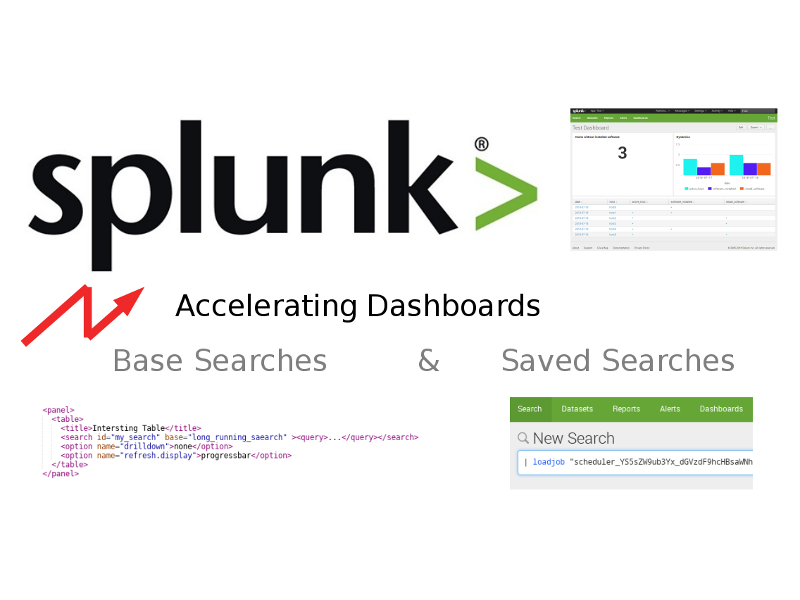 But to update the dashboards automatically (I think that this is the most optimal way – manual editing is too hard and routine), we will have to work with saved searches via Splunk API. In order to work with the saved search, we need to know the application, where the search will be created, and its author. This the same as for dashboards, that I described in “How to create and manage Splunk dashboards via API“. cron = "00 12 * * *"
But even after that, I did not get the data from this search by it’s name, only by sid. It is not very practical. So, I just scheduled the search to run at the current time + 2 minutes for debugging. And then scheduled the search to necessary time. Knowing these basic operations for dashboards and searches we can automatically create and update them from own Python scripts. This entry was posted in API, Security Information and Event Management (SIEM) and tagged cron, json, python, Splunk on October 21, 2018 by Alexander Leonov.